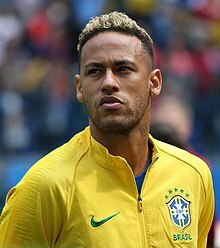 MADRID, July 3: Real Madrid have dismissed as “absolutely untrue” reports of a 310 million-euro ($360-million) bid for Paris Saint-Germain’s Neymar that sparked rumours he could serve as a replacement if superstar Cristiano Ronaldo leaves the Spanish giants. The colossal transfer claim, which would dwarf the 222 million-dollar deal that made Neymar the world’s most expensive player last year, was made by Spain’s public television station TVE on Monday evening. Real were quick to knock it down, saying in a statement they had not been consulted by TVE before the broadcast. “Real Madrid have made no offer of any kind to PSG or the player,” added the European champions, the home of Ronaldo since 2009. TVE stood by its reporting however, saying on its website that the claim came from sources it considered to be the “most reliable”. The report came hours after Neymar’s Brazil saw off Mexico 2-0 in the World Cup last 16 in Russia to set up a tantalising quarter-final clash with Belgium. Despite Real’s strong rejection, the transfer rumour mill swirled at the possibility of a galactico swap, following hints that both Neymar and Ronaldo could be unhappy at their star-studded clubs.